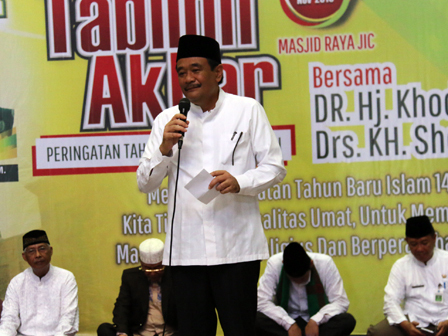 Jakarta Vice Governor, Djarot Saiful Hidayat attended Tabligh Akbar (mass prayer) of 1437 H Islamic New Year Commemoration at Jakarta Islamic Center Mosque on Jl Kramat Raya, Koja, North Jakarta, Thursday (11/26).
" Hijrah isn’t only the moment of Muhammad left Mecca and stayed in Medina, its more emphasize on our better mentality,"
On the occasion, he hoped resident could embodying Hijrah (Move on) spirit by changing bad life style and keep the cleanliness. The real Hijrah that is changing from good to better. “Hijrah isn’t only the moment of Muhammad left Mecca and stayed in Medina, its more emphasize on our better mentality,” he expressed, Thursday (11/26). Hidayat cited as an example of hijrah is the residents’ attitude of throwing trash. From littering to trash sorter. “The point is in our willingness,” he exclaimed.